Drawn to a behavior she didn’t understand, a UO researcher watching bonobos in a zoo has revealed how young female bonobos prepare for motherhood. Her findings, now online, will be part of a special issue of the journal Physiology & Behavior. The study documents how young females acquire maternal skills and forge alliances that pay off in times of hostility by handling infants, whether they are related to them or not. The research, done with captive bonobos at the Columbus Zoo and Aquarium in Ohio, also explains behaviors that scientists have seen but only focused on in the wild, said study co-author Frances White, head of the UO’s anthropology department. White has studied bonobos in their natural habit in Africa for years. This study, she said, allowed the team to take that knowledge and explore individual relationships in a way that has not been done in the wild. Bonobos in the wild live in a small area of the Congo Basin in the Democratic Republic of the Congo. They are often mistaken as chimpanzees but are a separate species. The females hold high-ranking positions and often form female-female coalitions that stand up to males. Boose — born in Yakima, Washington, but raised in a tiny, rural community north of Ohio’s capital city — came to the UO in 2009 after earning a bachelor’s degree from Ohio State University. She now holds a doctorate from the UO and has been teaching while completing a series of papers based her observations at the Ohio zoo. Her new findings, which drew from 1,819 hours of observations of 11 females and eight males during summer months of 2011-2015, were surprising, Boose said. Initially, Boose observed that all juvenile bonobos, ages 3-7, were obsessed with handling the infants, all under age 3. As they entered adolescence, however, females continued to approach the mothers and help care for the infants, while males turned away in favor of other behaviors. Boose also found a hormonal link to her observations. Elevated levels of oxytocin — associated with complex social behaviors and social cognition, including maternal and caregiving activities — were common in urine samples collected after infant-handling activities. As young females interact with the infants, Boose said, increased oxytocin may reflect how the body reinforces caregiving activity or social bonding with mothers or infants. 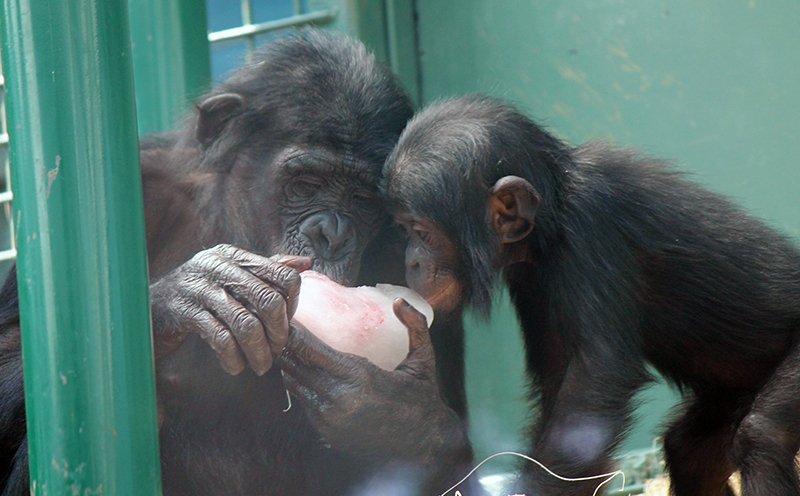 That bonding also reaped dividends for young female bonobos. Mothers often came to the aid of younger females that had handled their infants when conflicts arose over access to food and other fighting situations. The work provides preliminary evidence for where bonobos fit among the various theories about infant handling among primates. UO anthropologist Josh Snodgrass, UO anthropology graduate student Colin Brand and Audra Meinelt of the Columbus Zoo and Aquarium were co-authors on the study.